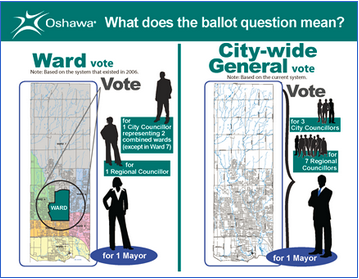 In the upcoming municipal election, the city of Oshawa will have a ballot question asking voters whether the city should return to the ward system - that is, electing councillors based upon neighbourhoods rather than the current "councillor-at-large" method. Oshawa previously had a ward system, but changed to an at-large voting system for the election of 2010. The question of moving to the councillor-at-large system originated with a 2006 ballot question. The turnout was low and thus non-binding, but City Council moved ahead with the decision to elect councillors at large for the 2010 election. Proponents of the councillor-at-large system say that there is more accountability since councillors are responsible for the entire city. I argue the opposite is true. Not having a councillor with a responsibility for a particular neighbourhood makes it challenging with respect to whom to contact should you have neighbourhood issues - by-law problems, questions of city policy, community advocacy etc. The theory is, that with councillors-at-large, you can address issues with any member of council. This system of municipal government probably works well in small towns and hamlets, but is impractical for a city the size of Oshawa. While I'm not picking on anyone in particular, if a councillor feels their voting base does not reside within a particular neighbourhood, they may be less likely to respond to questions or concerns from voters there, preferring to concentrate on the areas of the city more likely to return them to office. Problem or at-risk neighbourhoods may be less favoured than more politically active, typically affluent, neighbourhoods. I strongly encourage voters in Oshawa to return Oshawa to the ward system. I also strongly believe that the city should respect the results of the ballot question regardless of the turnout. (ii) those elected to both City Council and Durham Regional Council, other than the Mayor, by ward vote instead of general city wide vote?